Enter the name for decal, also enter the font choice number. 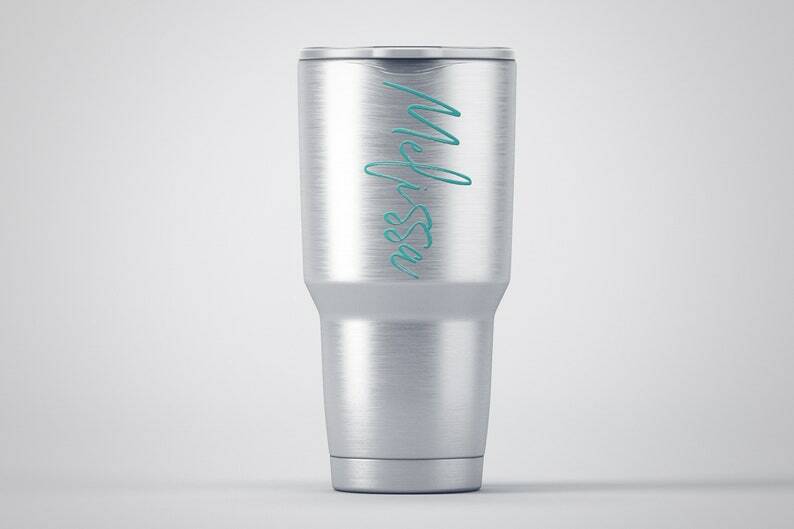 Personalize any surface* with a monogram decal with your choice of initial and name. Decal is made from permanent outdoor vinyl and can be attached to almost any flat/hard surface. Your choice of color and size. Decorate your phone, car, laptop, desk, books, walls, etc. *Decals will stick to MOST surfaces including: glass, wood, metals, and most plastics. Each decal comes with instructions on how to apply. Sizing for this listing is total width of decal, height will vary based on decal size and number of letters. Want a larger/smaller size? Contact us for a custom quote/availability. Want it made to be ironed/heat pressed on clothing? Contact us for details. Proofs: We will NOT send proofs of any kind, for any reason. It conflicts with the commercial license we hold. Thank you for your understanding.